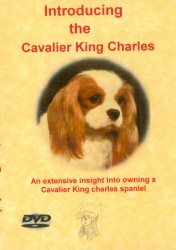 Cavalier are delightful companions which are intelligent and easy to train. They have a lovely temperament and they just love to sit on your lap or go out for a leisurely walk. Being quite adaptable they would fit in with whatever life-style you may have, although it is not recommended they be left alone hours on end as they were bred to be a companion dog and like to have company. Although Cavaliers are not a yappy breed they will bark when something is out of the ordinary. There is really no difference in temperament in Cavaliers between the sexes, as all are extremely affectionate and adorable. Cavaliers are a toy breed of dog which usually weigh between 12-18 pounds. Some Cavaliers can be a little larger than this and weigh up to 25 pounds. They come in all 4 colours. 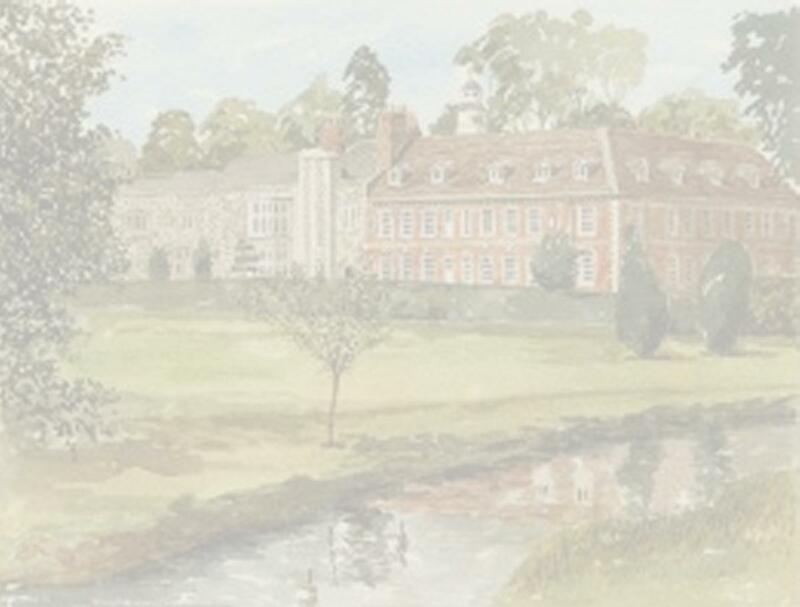 The 'particolours' which are Blenheim (brown and white) and Tri-Colour (Black, white and tan) & the 'wholecolours' which are Black & Tan and Ruby. 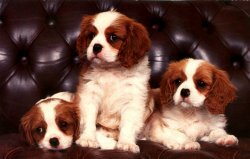 Cavaliers have a lovely soft silky coat, with lovely feathering on the ears, tail, belly, back legs and chest. They should be bathed weekly to fortnightly with a brush at least once a week, paying particular attention to the feathering behind the ears as this is where knots may happen and behind the back legs on the feathering. 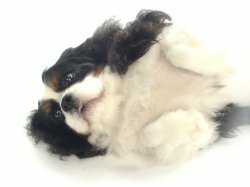 Occasionally Cavaliers do drop or shed coat (usually once or twice yearly with the change of seasons), brushing the coat quite regularly during this time will remove the dead hair. Nails should be cut monthly to stop them growing too long. The following articles provide some views on owning the Breed, click on each link to read more. Contact Jenny for details of a DVD packed full of invaluable information for owners and potential owners alike.